Living in a coastal community as we do here in the Northeast means that many design details in a home are catered to the coastal lifestyle. Whether you are planning for your main residence or a summer home, any home in proximity to a beach is often going to have (or want) an outdoor shower. It’s a matter of practicality really; the comings and goings from the beach can get messy and having a space to rinse off before entering the home means less of that sand and grit make it into your living space. Plus taking a shower out in the open air with a view of the sky & stars is just plain AWESOME. If you’ve never had the opportunity to do it then you’re missing out, but back to the topic at hand. When planning for an outdoor shower why not take it a step further and amp up that functionality ten-fold with an indoor/outdoor bathroom. While not a new idea this one is definitely one we don’t see too often. This design detail was incorporated into one of our Plymouth Whole House Renovation projects that architect Jennifer Drain of Archiplicity worked with the homeowner to develop the layout that essentially combines an outdoor shower with an adjacent half bath accessible from the showering area on the exterior. I have to admit that it’s not too often you see an exterior door that leads directly into a bathroom but in this case it’s just pure genius. Let’s face it when you are gearing up for a shower there are inevitably other areas of the bathroom that are needed. 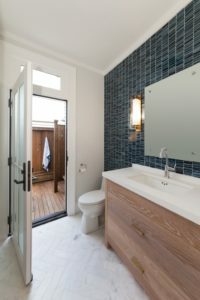 This particular home has the toilet and sink portion of the bath on the interior and the mahogany enclosed shower & changing area on the exterior. The frosted glass door allows light to flow to the interior while still providing a measure of privacy to the showering area. Another bonus is the ability to have direct access to a bathroom from the exterior. Perhaps the kids are having fun in the mud and you ask them to come in and get cleaned up for dinner. Instead of trailing that mud through the house they rinse their feet off in the shower and hands in the sink and are cleaned up and ready for dinner before even setting foot in the main living space. Keep in mind though that an outdoor shower will require a bit more maintenance than the indoor variety especially if you live in the Northeast or any other cool weather climates. The piping will have to be winterized to prevent freezing so the outdoor portion of the bathroom will be out of commission during freezing temperatures. Even with limited use in the winter months we feel an indoor/outdoor bathroom should be on most coastal New England homeowner’s wish lists. If an indoor/outdoor bathroom is on your wish list, contact us to get the planning process started and let’s make that wish list a reality!